Lions exist to serve their fellow man around the world. The Brazosport Evening Lions Club exists to fulfill this charge from the International organization but we also exist to serve our Brazosport family. June 9 "Adopt-A-Highway" trash pick-up. Feb 3 Participated in the Scholastic Bowl at the Brazosport Center for Arts & Science. Feb 18 "Adopt-A-Highway" trash pick-up. 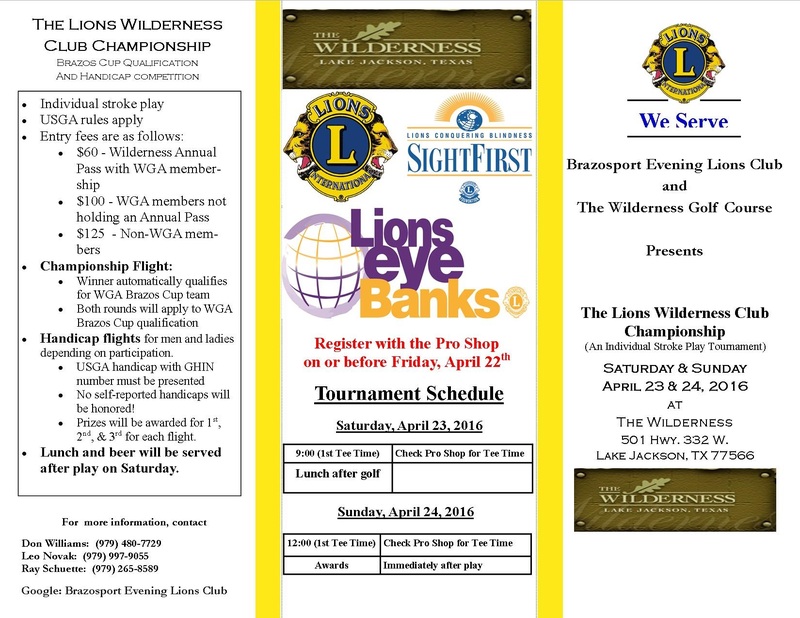 April 22-23: The Lions Wilderness Club Golf Championship. Thanks to our sponsors. Feb 18 Participated in the Scholastic Bowl at the Brazosport Center for Arts & Science. Feb 26 - Participated in the Scholastic Bowl at the Brazosport Center for Arts & Science. April 26 (Sun) The Lions Wilderness Club Golf Championship. Oct 9 thru Oct 17: Brazoria County Fair. Feb 15 - Participated in the Scholastic Bowl at the Brazosport Center for Arts & Science.